Dujour.com — In 1981, it was no walk in the park to live in New York City. Over the course of 12 months, the city was reportedly home to over 2,000 murders and more robberies than ever previously committed. Cupcake shops were not opening on a regular basis. In director J.C. Chandor’s A Most Violent Year, businessman Abel Morales (played by Oscar Isaac) attempts to navigate these brutal waters as his fortunes swell and the target on his back grows to keep pace. More than 30 years later in a very different New York, Isaac himself is in the midst of an impressive ascent—albeit one marked by a lack of circling thugs. While the chorus of adulation for Isaac’s role in A Most Violent Year is still resounding, the Guatemalan-born actor doesn’t seem interested in pausing to enjoy it. In the coming months, he’ll appear opposite Mark Wahlberg and Garrett Hedlund in Mojave, he’ll star in the artificial intelligence thriller Ex-Machina and he’ll be deified by nerds everywhere for his roles in J.J. Abrams’ upcoming Star Wars: Episode VII – The Force Awakens as well as Bryan Singer’s X-Men: Apocalypse. 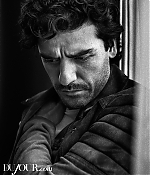 Isaac, who got his big break in the 2013 Coen brothers movie Inside Llewyn Davis, says there’s no one sort of character or film that he finds appealing. That was certainly the case with Chandor and A Most Violent Year. Isaac’s Morales is an up-and-coming oil titan whose fleet of trucks—not to mention his family—is being terrorized by his competitor’s goons, but who refuses to lower himself to their level. It was a mindset Isaac took pains to understand. Considering the demand for Isaac and the year he has ahead, that might be no more than wishful thinking.